We are two weeks deep into the New Year and I am sure all of you have already hit the ground running. If you are anything like me, then you probably either forgotten to make a New Year’s resolution or could not think of one. Therefore I’ve decided to save everyone the trouble and compiled a quick list of 8 New Year resolutions I think designers should have. Just pick one and enjoy! Make your online and off-line presence felt. Plan to meet more people in the real world, go to that party you keep pushing off, or even attend that design forum. Going online, dabble in social media, start a blog or a website, and do everything you can to get noticed! Had enough of designers? Aim to take a different non-design colleague out for lunch at least once a month. This will not only stimulate your creativity but will also open you up to different ideas and radically different perspectives. Not to mention that the connections you make, will be a boon for your career! Most of us always wait to the very end, especially when we change jobs. And when that happens, we are scrambling! So do try to find some time at the end of every project to document that project. Then target to update your portfolio every 6 months, or try to do so at least once this year. What I do is mark it into my calendar and you should too! Get back to the basics and try to sketch, CAD, present, pitch, model make etc. a whole lot more. In a broader spectrum I think we can add “read more and look at less picture books” to this list. If you have not already done so, perhaps this year will be the year to get your passion project going! There is no time like today, particularly with great services like Kickstarter, Shapeways, Etsy, and the plethora of e-commerce and social media marketing engines. Don’t worry if the project fails, the learning experience is priceless. In today’s digital environment, is this even possible? Sure thing. If we just cut down on our multitasking with email, social media or online games, and just focus on one task at a time, I can guarantee that you will get so much more done. I make sure that I find time everyday to batch process everything. You will not miss that last Tweet as much as you think you will. This is my favorite call to action for all designers and I’ve included it here again. I always say designing solely on the computer is inefficient as it causes you to lose a sense of proportion. Going back to the basics of design (i.e. pen on paper) will bring you back to the core of things, not to mention sketching outside inspires you to no end. They say that when we clutter our workspace, we also clutter up the energy of the place. The most obvious way to combat this is to regularly de-clutter your workspace. This workspace should include your desk, computer desktop and even your thoughts (via a to-do list). Try it out and immediately feel good with a neatly organized desk. I hope this list of 8 ideas helps you get going. I am sure you have your own resolutions and I would love to hear them below? And before I forget, Happy 2012 dear reader and thank you for all your support! Hey thanks Brian for sharing those – my top 3, by far, are the “Update your Portfolio more Frequently”, “Practice Design More”, and “Passion Project” – I’ve been getting around to those for quite a while, and good to see others think the same! Great topic! I already, since a couple of years I have adapted my workflow to using short & longterm To Do lists. Either on paper or my project calendar, that is then synced with my smart phone. It is incredibly efficient, as this way I rise my productivity and keep the deadlines. Also a good way to keep a clear head, and refresh with inspirations is visiting art galleries, take your drawing skills to a different level, by drawing different themes than those involved in a project. Draw urban landscapes, sci-fi, nature … as this will sharpen your sketching ability and broaden imagination. 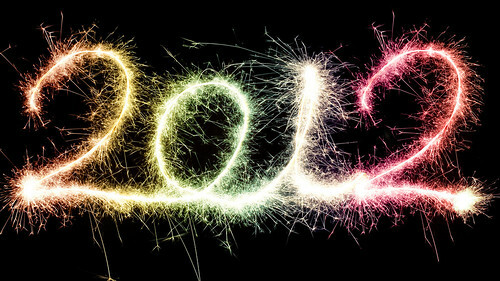 Wish a successful 2012 to all!